Military funeral honors are a respectful way to show our country’s deepest gratitude to those brave men and women who, in times of war and peace, have faithfully defended our country. 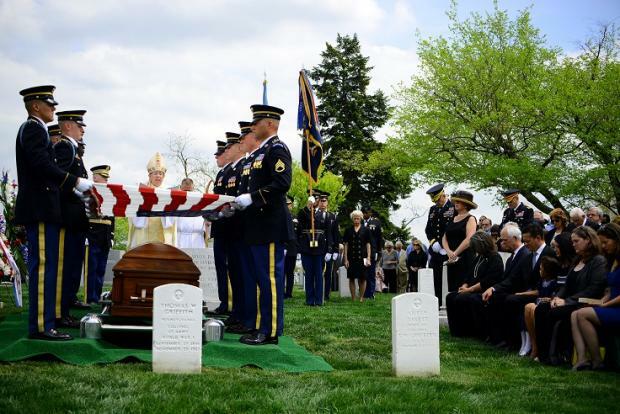 Funeral ceremonies provide a reminder to all U.S. citizens of the tremendous sacrifice each member of our military makes, as well as the final demonstration a grateful nation can provide to a grieving veteran’s family. Understanding the deep meaning behind the different aspects of a military funeral will help anyone get in touch with the rich history that influences military tradition today... especially the meaning of the folded flag. The third fold is made in honor and remembrance of the veteran departing our ranks, and who gave a portion of his or her life for the defense of our country to attain peace throughout the world. The 10th fold is a tribute to father, for he, too, has given his sons and daughters for the defense of our country since he or she was first born.